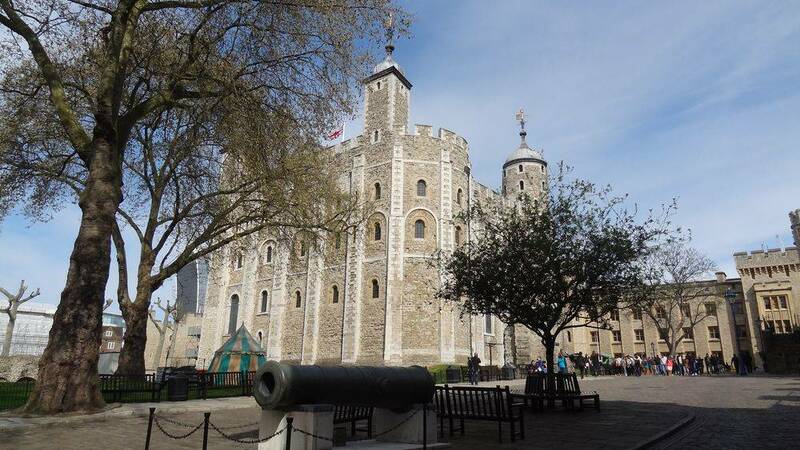 The white tower is the tower of the Tower of London, it is the main building of the fortress. It is also the very first building that was built for this place, between 1078 and 1100, but at the time it was built of wood, as was done at that time. It must be said that the techniques for building stone were not yet acquired. It was William the Conqueror who was at the origin of it. The tower as we know it was built very quickly, around the year 1100. For the time it was already a very impressive dungeon. Its aim was to block the river traffic of the Thames, but above all to secure control of the city of London, the principal city of England, whose control enabled it to assert its authority over the whole of the south of the island. There were three towers in London, but the other two were of less importance. The Tower of London was really the lock of the future British capital. The white tower is a building of monobloc aspect, it is formed on the basis of a rectangular plan of 32m by 36 on 27m of height. The two western corners are equipped with a small square tower, while the north-east corner is equipped with a round tower containing the staircase. 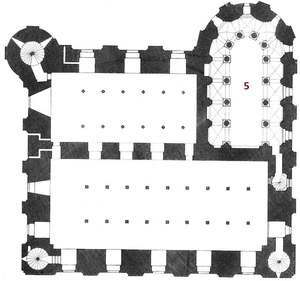 The south-east corner is not equipped with a tower but with a semicircular bulge: It is the external effect of the presence of the apse of the chapel, inside. The white tower has four floors. 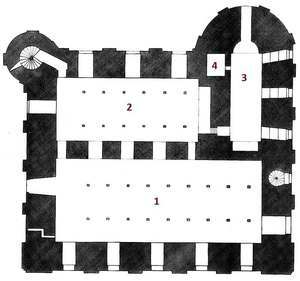 The ground floor, the first, the second and the third floor, all of about 680m2. As the entrance is on the first floor, the ground floor is sometimes called the "basement", especially since the English, like the Americans, count the floors from the ground (only the French do it from the 2nd level) The 3 levels are constructed in the same way: A large room in the West (which allowed access to the two square towers), a more modest room in the Northeast, floor being formed of the chapel. The latter crossed all the floors, from the floor to the ceiling, so there was an internal wall which made the circuit to separate it from the rooms to be lived. The walls of the donjon are 4m thick. The entrance to the white tower is made on the first floor by a door accessible only by a wooden staircase. At the time of construction it was probably a ladder, but having a height entry and a removable access system is one of the characteristics of the Norman dungeons, so it was an architectural import of William the Conqueror. This entry was condemned from the sixteenth century to 1973, between the two it was necessary to pass by another entrance, north side, which brought the visitor in a small room serving either the first floor or allowing the climb by the staircase to the higher level . It was therefore more practical, but less authentic. In addition, the white tower was built on the side of a small embankment. This situation allowed the ground floor to be partially buried, so both to be protected naturally but also to remain fresh, which is important when we know that this room was the cellar. This room was illuminated by thin openings of the exterior walls. The ground floor of the white tower was a storeroom, it was here that the provisions were kept in order to hold the siege, but also and probably all that was necessary for life in autarky. Its current state does not reflect its construction: The cellar was completely redone in the eighteenth century. The floor was lowered, the vaulted wooden ceilings were replaced by stone vaults. 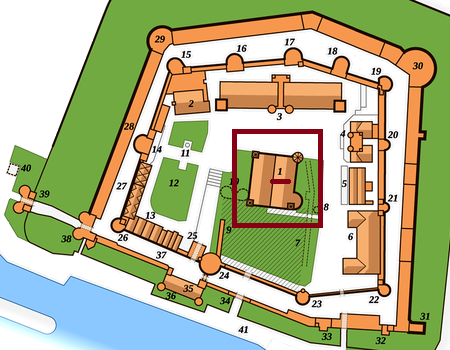 The first floor is that of the constable (responsible for the fortress) and the officers. 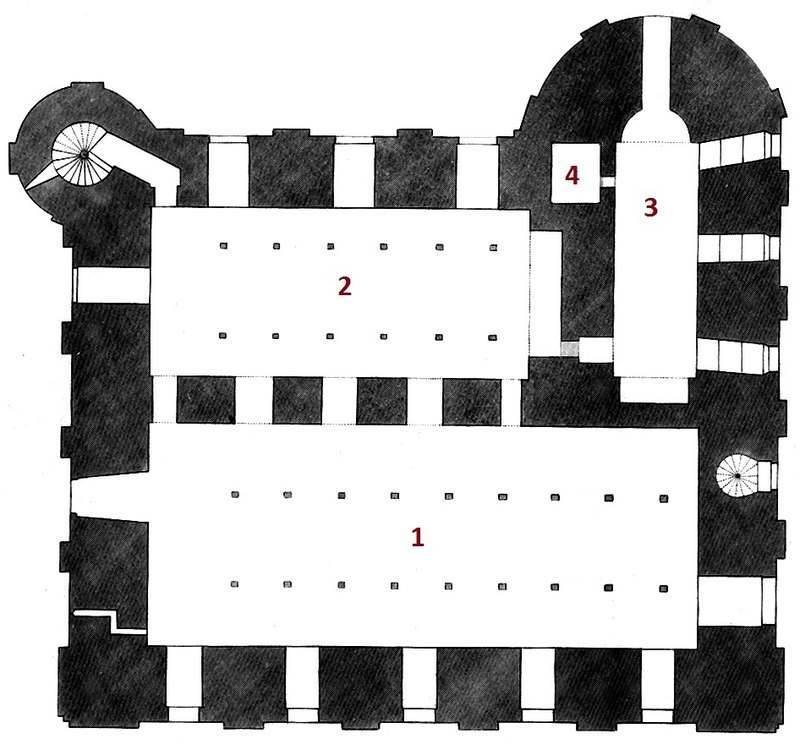 It was made on a 3-room plan: The large room in the West, which serves the two defensive towers, a small room in the Northeast (which used to serve as an entrance) and the chapel. The latter extending over the 3 levels, it had a great height. It was at this level that one could enter the chapel, through a door of the room to the Northeast. This chapel was dedicated to St. John. The second floor was made like the first of a large room to the west and a small room to the northeast, since the rest of the floor was taken by the chapel. This floor was initially equipped with a gallery which made the tour, but since the construction of the fourth floor, it disappeared. This floor was also endowed with a beautiful Norman fireplace, a rather rare piece in Great Britain. His smoke was evacuated through holes right next to the walls. Originally there was a protruding hood to keep the smoke out of the room. Finally the third floor, a late construction, required the rise of the roof that was redone on this occasion. This work was begun in the sixteenth century following the improvement of artillery, a combat technique that was rather effective against the old fortresses. The white tower was thus modified so that its roof could bear the weight of the guns that were installed there. 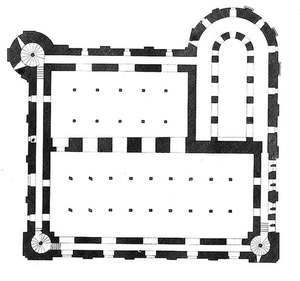 The plans below are those of the white tower as it was before the changes at its top. At the time of its construction, at the end of the eleventh century, England was not structured as it is today (of course), to build a building the size of the white tower, much more complex than would be the case today. The stones come from Kent, an area south-east of London, which runs from the current capital to the tip of the country. It is an alluvial area close to the Thames estuary. We also used a local stone with an extremely fine granulometry called mudstone (even in French). For the decorations it is Caen stone that was used, it was imported by boat across the English Channel. But almost nothing remains of these stones, they were replaced in the seventeenth and eighteenth century by stone of Portland, a British island quite close to London. It is the color of these stones that gave its name to the dungeon, the "white tower". Most of the windows of the Tower were enlarged in the eighteenth century and only two of them are still original. They are in the South wall, at the level of the gallery. 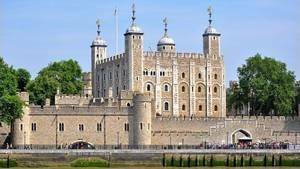 As a keep of the Tower of London, the white tower was the ultimate protection for those who intrenched in it. But it was still equipped with external protections to avoid being taken too fast. As soon as it was built, the tower was surrounded by a wooden palisade, which made its way to the north and west. In the east there was the ancient Roman wall which provided security, and to the south the Thames prevented any attempt at attack. We are then in the eleventh century. When the tower was rebuilt in stone, towards the end of the eleventh century, a stronger wall was built, but it was still a mere defensive wall. It was in the 14th century that the white tower received the protection it deserved: A true fortified enclosure, with defensive towers regularly distributed. It was the first campaign of fortification. 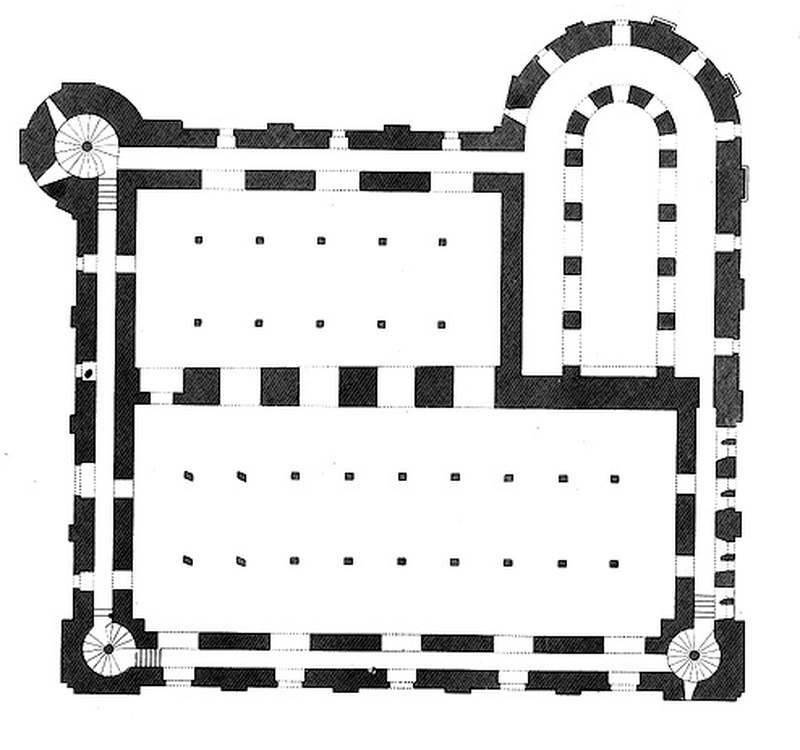 The second came two centuries later, with the construction of a second enclosure much more massive. The sites for the storage of weapons had to be improvised during the reign of Henry VIII. The roof of the white tower was reinforced to support the weight of the guns. In 1530 they added the famous turrets so characteristic, with their domes in the form of onion. It is a very curious setting for a medieval fortress, knowing that this form is rather the prerogative of the Mughals of that time. One of the prettiest proofs is the shape of the roof of the Taj Mahal, which was constructed approximately at that time (almost 100 years ago, though ...) but uses this form for its roof. It is said to be bulbous. (Learn more about the Taj Mahal). "The Royal Armories" is the name of the oldest British National Museum, located on the lower floor of the White Tower. It features many royal weapons and armor, real-size wooden horses and depictions of the different kings, set in a situation. The enormous armor of King Henry VIII is exposed alongside the armor of King Charles I and James II. This exhibition is called "The Line of Kings", which means "The Lineage of Kings". Ranulf Flambard, bishop of Durham and minister of William II, was imprisoned at the White Tower by King Henry I on August 15, 1100. On February 2, 1101 the bishop made a bold escape, descending from his window by a rope that his friends had smuggled them into a barrel of wine. 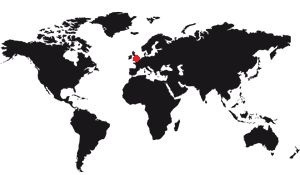 Flambard was not taken again and fled to Normandy. In 1255, during the reign of Henry III, a number of Jews were imprisoned in the White Tower, awaiting execution for the alleged murder of Hugh of Lincoln. Eighteen of them were hanged. In 1270 anti-Semitic sentiment grew in England, culminating in a decree of King Edward I that the Jews were a threat to the country and therefore all Jews had to wear a yellow star to be identifiable. 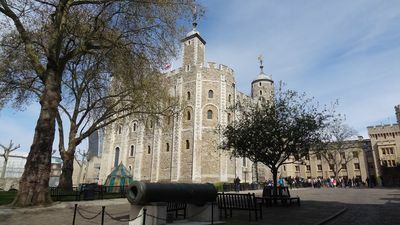 Among the other prisoners housed in the White Tower are Jean le Bon, King of France captured by Edward, the Black Prince in 1360, and Charles, Duke of Orleans, who was captured at the Battle of Agincourt and imprisoned in 1415. The St John's Chapel is one of the two chapels of the Tower of London. It is the medieval chapel. It is integrated into the white tower, it is an integral part of its plan. It is a chapel with a rectangular nave ending in a semicircular apse which emerges on the outer part. Moreover, the fact that the apse exits above the walls of the cellar proves that it was built later, it is therefore a subsequent modification to the construction of the white tower. This chapel is very pretty, it is surrounded by heavy massive pillars but the spacing gives an air impression. For a place inside a dungeon, it can be said that the effect is successful. The altar is made with the same stones as the walls. 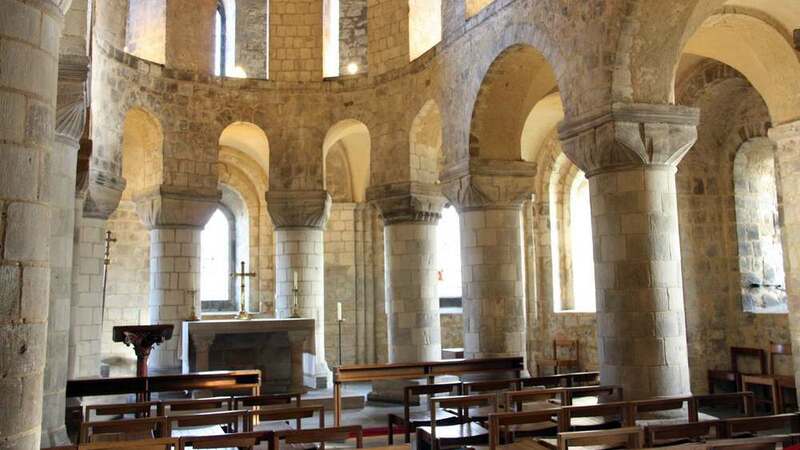 It was precisely by doing work on the St Jean chapel that in 1674 the skeletons of two children were discovered in the White Tower during the demolition of a staircase. They were contained in a wooden box, buried 3m below the ground. These bones are supposed to be the remains of the princes of the tower, Edward V and his brother brother Richard, the Duke of York. At the order of Charles II they were buried 4 years later in the chapel Henry VII at the Abbey of Westminster. A monument designed by Sir Christopher Wren now marks the supposed place of rest of these princes. Learn more about the chapel St John or the two princes.